WASHINGTON (AP) The Washington Wizards know how hard it is to put away the Philadelphia 76ers. When the chance came early Sunday night, they had to take it. 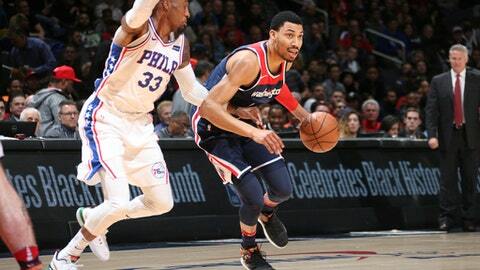 Otto Porter scored 24 points, Bradley Beal added 23 and the Wizards had a dominant second quarter that helped seal a 109-94 victory over the 76ers in a crucial game in the Eastern Conference standings. The Wizards improved to 9-3 in an extended stretch without All-Star point guard John Wall (knee surgery), in a game where a loss would’ve seen them drop behind the 76ers based on winning percentage. Joel Embiid had 25 points and 10 rebounds for Philadelphia, which dropped a half-game behind Milwaukee into seventh, and two back of Washington in the congested East standings. Simmons added 16 points as the 76ers lost for the first time in eight games to settle for a 2-2 split of the season series. It was Philadelphia’s eighth consecutive loss in Washington. The Wizards outscored the 76ers 37-20 in the second quarter to build a 67-48 lead by halftime. Oubre sparked the outburst, shooting 6 of 9 from the floor and 4 of 6 from beyond the arc before the break. Washington shot 60 percent as a team (27 of 45) in the first half and finished at 54.4 percent (43 of 79) to fight off a late comeback bid. Philadelphia cut the deficit from 23 down to 14 in the third, then got to within eight twice midway through the fourth. 76ers: Shot 19 more free throws than the Wizards, hitting 23 of 31 … C Amir Johnson returned to action after not playing in Saturday’s home win against Orlando. … Embiid had his 31st double-double of the season. Wizards: Tomas Satoransky’s 10 assists were the second-most of his career. … Sunday marked the first of 13 consecutive games against teams that entered the day holding an NBA playoff position. Oubre had shot 28.6 percent (22 of 77) from the floor and 22 percent from 3-point range (9 of 41) over his last eight games before the All-Star break. In three games since the season resumed, he’s shooting 50 percent (17 of 34) overall and 47.1 percent (8 of 17) from deep. Meanwhile, the 76ers hit just 36 percent of their shots (31 of 86) and 27.3 percent of their 3 attempts (9 of 33). 76ers: At Miami on Tuesday night. Wizards: At Milwaukee on Tuesday night.